Elephant riding tours in Bali will be the next tour destination after you are satisfied enjoy the beauty of Bali tourist attractions. You will be curios about our next tour program, how it feels to ride an elephant, or even you do it with your family or with your loved ones. It’s an amazing Bali day tour at Mason Elephant Park with experience driver Bali. 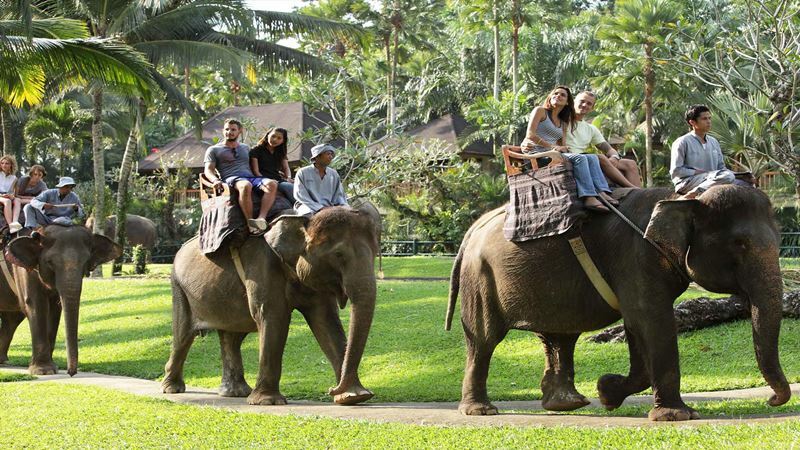 This elephant ride adventure tour is located in the village of Taro Ubud, this recreation is very popular among domestic and foreign tourists. If you come along and traveling with children, this activity will be more fun for them as they will see the big creatures in beautiful park. Tour packages in Bali usually including visit coastal, mountain, temple or historic sites. But by participating in an elephant ride adventure in Bali, it will be enough to provide an alternative journey with a small adventure and full of sensations to know animals that we have never touch directly, and now you can even ride it ready to capture it into a pleasant moment, along the Taro Jungle. The most famous for the elephant riding adventure in Bali is at the Mason Elephant Park or formerly known as the Elephant Safari Park Taro, located in the village of Taro and still a district of Ubud, Gianyar Regency. If you start from the airport it takes 1,5 hours drive, you may come by yourself by renting a car in Bali, or if need our cab Bali services, we can also visit a number of other tourist objects adjacent to the mason Elephant Park such as visiting the center of Ubud with Palace, Ubud Market and monkey forest or can combine with visit Goa Gajah, Tampaksiring and Tegalalang. Or if you love the art performance, you may stop at Batubulan village to see Barong & Keris dance, Tegenungan Waterfall, Mas village for wooden sculpture or for ladys shopper, they can make stop at Batik Factory at Tohpati village and Silver jewelry at Celuk village, then your full day trip turn into a complete tour package. Mason Elephant Park is indeed a special place to enjoy elephant ride activities in Bali, if compared to other park, the area is quite wide located on 3.5 hectares of land forest of Taro, this safari park was inaugurated by the Minister of Tourism in 2000, becoming part of the World Zoo Association (World Zoo Association), and places that are recognized worldwide as animal protection meet international standards, all animals are properly implemented, so that safety, maintenance is a priority. Riding the elephant at Mason Elephant Park Taro, you can see the natural and beautiful natural scenery of the forest, this adventure recreation area is surrounded by forests that become national reserves, so the forest is well preserved, especially now as one the popular tourist attraction in Bali. These large tall animals are imported directly from their natural habitat on the island of Sumatra, they bring to Bali as the tourist attraction and also that the way how we keep and preserve the Sumatran Elephant. If you take one of Bali Cab Driver tour package, then it includes a ticket to the Mason Elephant Safari Park Taro Ubud, where when you are in the Park, you can do a number of activities such as taking pictures with elephants, feeding them, bathing, also including performances of smart elephants capable of painting, playing basketball and playing ball. The attraction will be an interesting part of your holiday, especially for your beloved children. In addition, Taro Ubud Elephant Safari Park features a museum with various collections about elephants, including skeletons from its predecessor. So that you can learn more about the origin of the animal. besides traveling as well as for educational purposes, souvenirs are also available with the production of accessories from these animals. So if you concern about the services of this park, with choose comfort, clean park with its 5start facilities, then the price offered will not be a problem for your best experience vacation. This park has been recognized worldwide, and is the most popular elephant safari activity, an outdoor activity offered by the 5-star Taro Ubud Elephant Safari Park, many capital artists and even world artists who want to try this activity, not only because of sensations only when riding an elephant, but when safari you can enjoy the beauty of the surrounding environment more leverage. 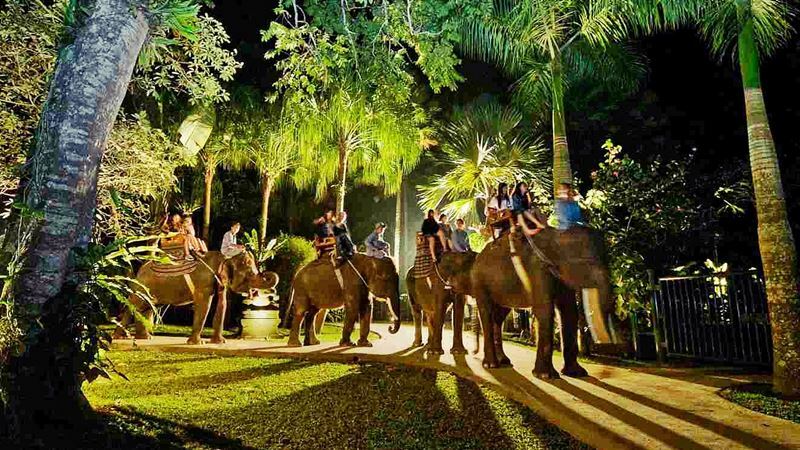 This park offering the trip from early morning with Bathing Elephant program with breakfast, at noon they offers elephant ride with lunch and in the evening they offers Safari Under Stars ride with dinner, so its really part of the services tourist who has different time to come to our park. If you stay in Ubud for your holiday, its much better you book this tour start from Ubud as the distance very close. If you have any tour idea to combine Mason Elephant Park with other sightseeing, please feel free to contact us to get some tour suggestion from BaliCabDriver officer.